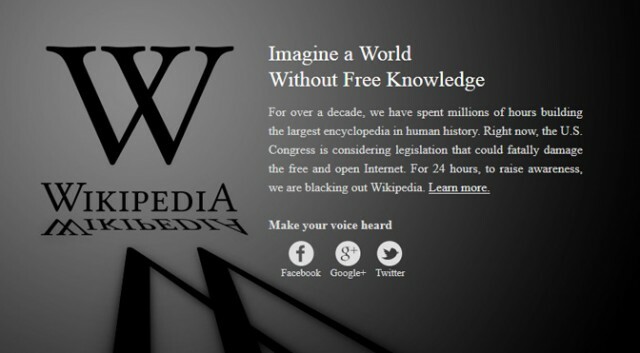 While I commend everyone who took a stand against SOPA/PIPA, I really have to hand it to Wikipedia for shutting down their site on the 18th. I depend heavily on the site for research, and I’m glad that the deadline for article I was writing for my other job was the 19th. (Before you judge me, I will disclose that the article was concerning superheroes and it was for a deal of the day website. It’s not like I write for The New England Journal of Medicine.) I can’t imagine how many others were affected by the temporary loss of Wikipedia. Think of all the students, all the people trying to settle bets, and all the obsessive entry contributors who had their livelihood come to a screeching halt. Cutting off what’s possibly the Internet’s most popular reference source is a powerful statement to make. I’m really dating myself now, but I remember in high school when librarians and teachers weren’t quite sure what to do with this newfangled Internet. We were told to avoid using it as a reference tool unless it was on sites ending in “.org” or “.edu”. Then in college, Wikipedia emerged. The Web address still ends in “.org” but we were told to avoid using that as well. The best way to get around that was to go to the sources listed at the end of the Wikipedia article and list them as your references. It’s not lying because you really did get your information that way. There just happened to be a middleman. The 24-hour loss of Wikipedia had such an effect that #factswithoutwikipedia became a trending topic of Twitter, leading to such amusing misinformation as, “Ferrets are a legume” and “‘Lego’ is a Danish word meaning ‘lost in the vacuum cleaner'”. And yet these were the kinds of tidbits that Wikipedia itself was accused of presenting as fact not too long ago. It’s interesting how that works. It’s a little like the old claims that no one would ever buy records when they could listen to the radio. Or that the VCR would destroy the movie industry. Or that Napster would destroy the music industry. Or that Kindle would desecrate the act of reading. It relates to SOPA and PIPA too. At this point, I seriously doubt that either of the two will pass, at least not without major revisions. And then one day we’ll all look back and laugh at how silly we were to think technological progress would obliterate society. Of course, I could be very, very wrong. The robot overlords could be lying in wait right behind me, waiting to taser me for all the songs still on my iPod that I downloaded off of Morpheus between 2003 to 2007.